This turned out to be not so obvious as expected. The Noiseless Portable had a very heavy going carriage. 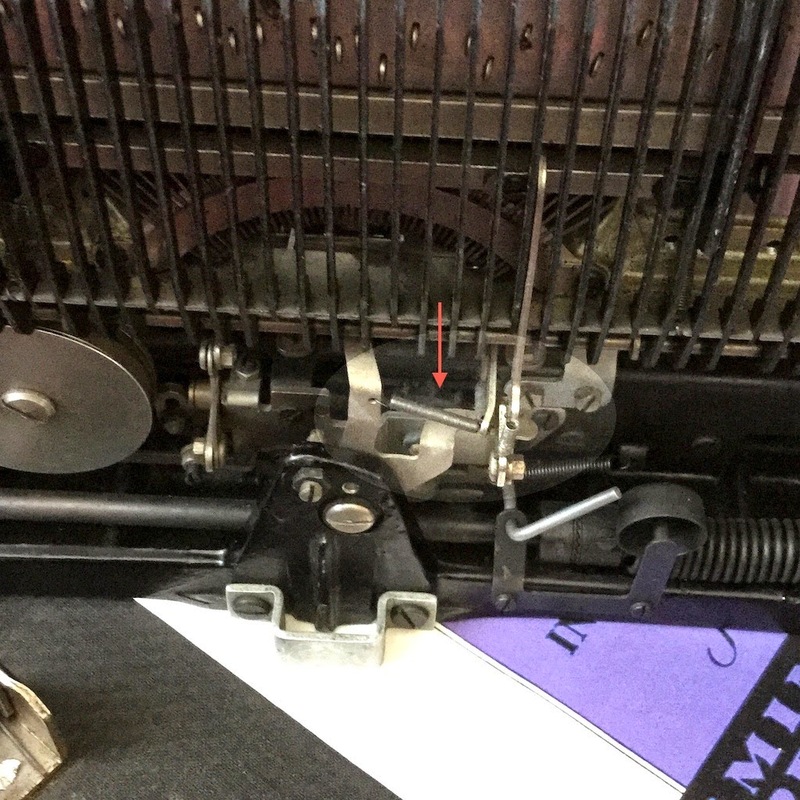 The mainspring tension was high and the carriage did not run all that freely on its rails in the middle of a page. After all the tweaking of the Portable #2's, an attempt to improve the RNP seemed in order. Releasing the tension of the mainspring is again done by the rocker-catch (blue), moving this back and forth will release the ratchet one tooth a time. At least, that is what it should do. There is a risk of whirring wildly, so moving the rocker-catch between both positions very deliberately is best. With reduced tension the carriage return still was heavy. With reduced spring it becomes now easier to get a feel for where the carriage is sluggish. Part of the cause may have been the line-gauges fouling the carriage. The bigger reason was likely old, hardened grease on the carriage bearings in the middle of the rails. The outer ends can be cleaned (oily rag) with the carriage at the extremes, the middle section however can't be reached so. Having read up a bit on recommended cleaning and how to deal with (old) oil and grease, some white petrol was brushed on the raceways. Moving the carriage back and forth and then removing dirt with a rag, the raceways were probably made cleaner. At least the rag was dirtier and the carriage moved a lot easier. Even now with the bearings cleaner, the carriage is heavy (mass) and does need a fair bit of spring tension to index quickly. Tightening the mainspring again was less obvious than expected. There must be a screw somewhere that I missed, but there is no easy tightening screw-collar as found on e.g. the #2. With some browsing of online resources, tightening seems to be doable by winding up the ratchet itself (green). Using a tool (e.g. small screwdriver, small needlenose pliers) this can be done, taking care to press the rocker-catch firmly back into the ratchet at every stop you make. Not elegant, but it gets it tightened. The original reason to get out the white petrol was actually the escapement. The RNP's tendency to skip could very well be caused by the escapement catch being slow to re-engage. Parts of the mechanism becoming slow is quite likely, with over 80 years of dust and grime accumulating. So with the machine upright on some rags, petrol was applied liberally over the escapement and then worked in. Impossible to tell if that completely solved it, but the skipping after this treatment has reduced. It is now possible to type a few lines of the letter 'a' without a single skip. I have used that method of retensioning. It feels 'Wrong' but it works. 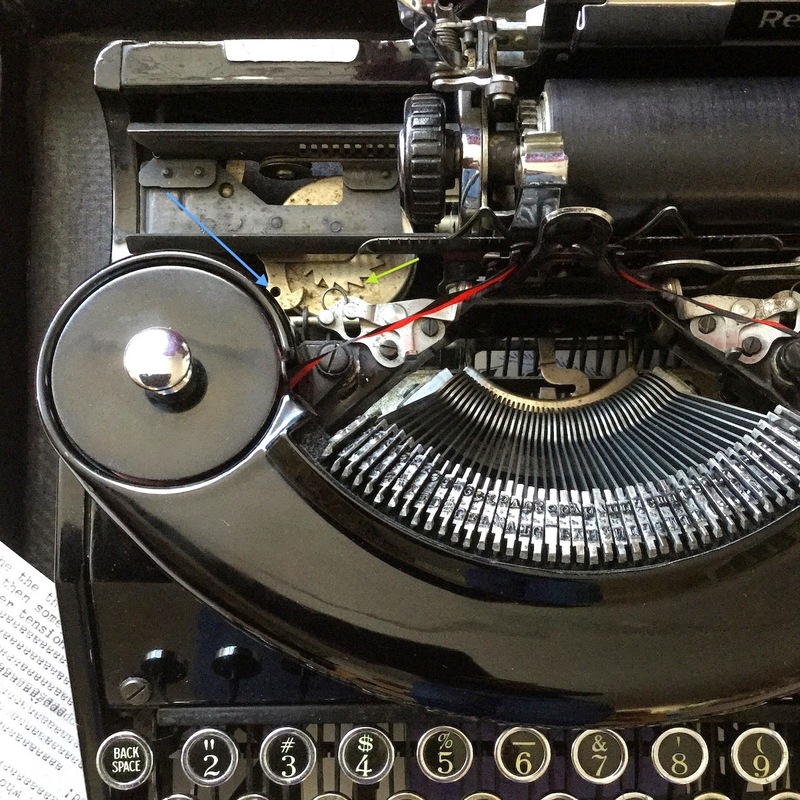 My rnps generally run fine but I do get skipping on the very similar remington rand model 1. That's the way I always tighten these springs on noiseless portables. I think there is a bar in the back of the carriage, higher up, that can also create friction and should also be cleaned. Must be the way to do it then. Unexpected for such solidly engineered machines.